As one of the foremost nursing homes in Central Jersey, we take pride in meeting the myriad healthcare needs of our population. Expanding our range of care and enhancing the quality of life of our residents with renal disease, Concord is now fully certified and equipped to deliver peritoneal dialysis on-site. Our state-of-the art program, offering both continuous ambulatory peritoneal dialysis (CAPD) and automated peritoneal dialysis (APD), minimizes the risk of infection and eliminates the inconvenience of transporting high acuity patients outside the facility for treatment. 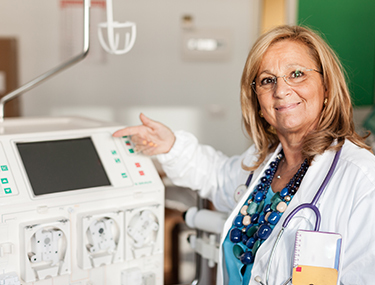 Under the auspices of a nephrologist, individual treatment plans are coordinated by our full-time nurse practitioner and implemented by our well-trained and compassionate nursing team.